For years, the Serbian dominated Belgrade government has supported and trained PLO terrorists. Immediately after the murder of Leon Klinghoffer aboard the Achille Lauro in 1985, the terrorist mastermind Abu Abbas was welcomed in Belgrade. Since the late 1980’s, Abu-Nidal has maintained a large terrorist infrastructure in Yugoslavia, in coordination with Libyan, Iraqi, and Yugoslav intelligence services. During the 1991 Persian Gulf War, as Iraqi missiles landed in Israel, Belgrade supported its ally Iraq. It is understood that Serb technicians are already helping the Iraqis prepare air-defense traps for Allied warplanes. The Iraqi air-defense system is currently based on obsolete SA-2 and SA-3 Soviet missile systems, which are no match for the sophisticated air power deployed by U.S. and British jet fighters patrolling the no-fly zones in northern and southern Iraq. The Iraqis are also reported to be seeking Serb assistance in modernizing their aging squadrons of MiG-21 and MiG-29 fighter jets. In return for Serbia's assistance in rebuilding Iraq's air defenses and making its jet fighters airworthy, Saddam has reportedly agreed to provide Milosevic with oil and cash to sustain the Serbs' battered economy and its war effort. The Serbian military would be unable to function without a supply of Iraqi oil. And hard currency, which Saddam acquires from illicit oil sales, will prove essential for paying the salaries, and retaining the loyalty, of the Serbian military. The London Sunday Telegraph reported that the alliance was initiated by a Serbian military delegation that visited Iraq earlier, shortly before NATO launched Operation Allied Force last week in Yugoslavia. The visit was intended to explore ways in which the two countries could cooperate to their common advantage. Along with traveling to conventional military sites, the delegation also visited an Iraqi pharmaceutical plant at Samarra, 100 miles from Baghdad, which U.N. weapons inspectors say is a chemical weapons production site. The visit by the Serbian delegation to Iraq was confirmed by the Foreign Office in London, where officials regard the growing cooperation between the two with alarm. "It appears they have identified a common aim - to shoot down Allied aircraft," a senior diplomat was quoted as saying. 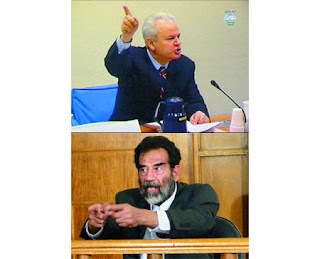 "Saddam and Milosevic see themselves as international outcasts who must support each other if they are to survive." Evidence of illegal arms sales came to light last October when NATO-led peacekeeping troops raided the Orao aviation factory in the Serb-controlled area of Bosnia. Among the documents they found was a contract for $8.5 million to repair and upgrade the engines of Saddam's MIG fighter planes. They also found a copy of a letter sent last September to the Ministry of Defense in Baghdad outlining precautions to avoid detection by UN weapons inspectors. They offered the help of Yugoslav experts to dismantle the equipment, and cautioned the Iraqis to hide the spare parts in a safe place. The letter went on to say that, when the possibility of being discovered had passed, the Yugoslav side would reassemble and operate the equipment again. That letter was sent to the Iraqis by Yugoimport, the Yugoslav arms export agency, and signed by the director of Yugoimport in Baghdad. That office in Baghdad wasn't just there to arrange the servicing of Saddam Hussein's MIGs. Just how much the Iraqis relied on the Yugoslavs for arms is laid out in a report by the International Crisis Group, an independent organization that seeks to pinpoint potential trouble spots around the world. We spoke to the author of the report, Dr. James Lyon. How big a laundry list? “Some estimates have put it as high as perhaps $3 billion, others $1.5 billion, no one knows for certain,” Dr. Lyon says. No one knows for certain because Yugoimport, which is a state-owned company, saw hardly any of that money. Shortly after the raid on Orao, Croatian authorities, acting on a tip from U.S. intelligence, intercepted a ship called the Boka Star, steaming on the Adriatic Sea, and brought it to the port of Riyeka. According to the ship's manifest, the Boka Star was headed for Egypt with a cargo of water filters and charcoal. But that's not what Croatian police found when they searched the hold. A tape shot by the Croatian authorities reveals that the Boka Star was carrying 208 metric tons of explosives--some for use in artillery shells, and some that could be used to produce solid rocket fuel for missiles. From Syria, U.S. officials say, those explosives would have been trucked overland to Iraq to fuel Saddam's missiles. 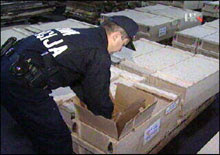 Although the sales invoice was stamped by Yugoimport in Belgrade, Croatian police found that the Boka Star's cargo and crew came from many different regions in the former Yugoslavia.